Wonder Workshop is the original STEM and coding robot for kids. 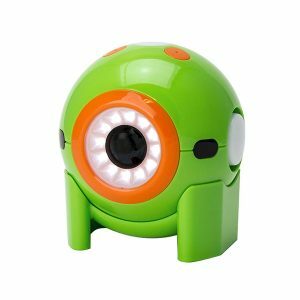 With one of these adorable bots, you can help coding come to live in a fun, interactive way for children. Which makes it one of my FAVORITE toys this holiday season. Since they are a big budget item for a Christmas list, I wanted to help you out by finding the best deals this Black Friday. First, you need to decide which one is best for your family. They have a few options. So in this article, I’m going to go over each Wonder Workshop Robot, who it is best for, and where you can snag the best deal this Black Friday! Ready? Let’s go! Dash is the original Wonder Workshop robot. It’s targeted for ages 6 & up, making it the perfect gift for the young elementary school age child in your family! It’s cute, fast, and programmable. Worried about not knowing how to code yourself? No problem! The in-app challenges will guide your learner through a sequence of new challenges. Dash also includes a microphone so you can playback recordings and have your little bot talk. If you have multiple children in your family or a neighbor down the street, Wonder Workshop dash can also interact with other bots! The creative opportunities for Dash are endless! So where should you buy Dash this year? The best deal we’ve found: Amazon! Buying it directly from Wonder Workshop was regular price ($149.99). So take that free 2 day shipping and save $30 by getting it on Amazon today! Cue is for your students who want to take their coding skills to the next level! The target age is 11 years & up. They don’t need to have used Dash before. They can still be fresh to coding, but Cue will give them more challenging coding activities within the app, and level-up their skills. It has the same features as Dash, but takes it a level further. You’ll still have the fast, two wheel design. Plus microphones and bluetooth connections to iOS and Android devices. Dot Creativity kit is designed for children 6+. It is the more budget friendly bot in the Wonder Workshop line-up. 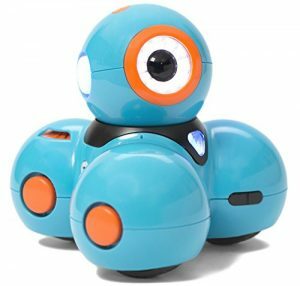 This little sphere bot can still be programmed and move quickly around your home. It comes with a variety of games and activities to challenge your learner. He connects to the Wonder Workshop apps. But he also comes with some bonus materials for more creative activities. Break out the craft box with this toy! You can purchase it on Amazon here for $79.99. Or purchase it directly from Wonder Workshop and use the discount code BFDCK18 for 25% off!